Intraday Trading is a very good career option. Anybody starting from Small businessman, housewife, retired person, salaried professional or young students can earn a lot of money by doing Intraday trading. However, it is risky career option and requires lot of knowledge and skillset. 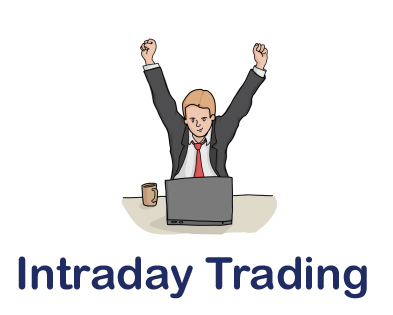 In this post, we will take a look at What is Intraday Trading? We will also discuss How to select stock while doing Intraday Trading? Intraday trading means buying and selling the stock on the same day with the intention of earning big profit. Here, stocks are purchased for trading and not the for investment. An online trading account is required for Intraday Trading. You need to select a stock price carefully while doing trading. As a wrong selection of a stock and a stock price leads to a disaster. How to select stock while doing Intraday Trading? The success of a day trader is mainly based on the selection of stock. Most of the time it is seen that people are unable to make a profit in trading due to wrong selection of stock. You should do a careful research before making an investment. It is seen that most of the trader invest in the stock without doing a research. I suggest following steps for picking a right stock and doing a research. First, identify the index and find out the sector where you want to invest your money. Create a list of potential stock picks from these sectors. Observe stock for few days. Look at stock price movement, volumes. and liquidity. Make sure, to select stocks that are liquid in nature. Liquidity is important for the selection of the stock. Liquid stocks have good transaction volume. This increases your chance of gaining good profit. Conduct technical analysis to find out the support and resistance level. It is not easy to find support and resistance level you need to learn technical analysis for the same. You can take help of few technical screener website for the same. It is always advisable to look at fundamentals of the stock. Fundamentals of the stock help traders to find right stocks. Another important point to consider while selecting stock is finding a stock that moves along with stock market. If you are able to find such stock your task is easy as you need to track the movement of stock market. Once you identify stock for intraday trading follow tips given below for successful day trading. Develop a plan for every day. Intraday trading requires lot of planning and readiness. You should track a limited number of stocks. Usually three to four stocks at a time. Discipline is an important quality for trader. You have to remain highly discipline while doing trading. Make yourself familiar with stock trading patterns. Controlling emotion is a must for the trader. Buy low and sell high in a day is key to the success of a trader. If you are beginner it is advisable to keep stop loss. A stop-loss will help you to cut down losses. There are few courses available on the internet for Intraday Trading. If you are beginner it is recommended to take such course. At the end, I would like to say that Intraday trading is very good career option provided you have surplus money, time and knowledge about the stock market. It is a mind game of technical analysis and only strong players will survive in this game. I am sure tips given above for Intraday trading will help you in becoming a successful stock market trader. If you have any query related to trading feel free to post it in the comment section. How to be a successful trader in stock market ? Technical Analysis or Fundamental Analysis – Which is better? I want to know the few courses available on the inernet for intraday trading and pl provide the best one. Apart from that provide me technical screener website for learing stock market.